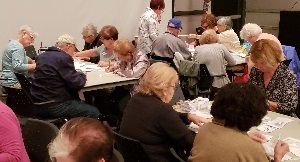 Indivisible of Monroe Township members were busy addressing, stuffing and writing post-it note messages on 1,200 absentee ballots sent to potential voters in Monmouth County in an effort to get out the vote for the November mid-term elections and flip the NJ 4th congressional district. The “post-it” party took place at the group’s monthly meeting on Thursday, September 13, at the Monroe Township Public Library. There are approximately 500,000 registered Democrats that didn’t vote in the last Mid Terms, but voted in 2016. Groups like ours throughout the state are working to reach those people with applications for mail in ballots.